Hyalogic, the leaders in Hyaluronic Acid, produce a full line of personal care products with premium hyaluronic acid. So what is Hyaluronic Acid and why is it good for your skin? Hyaluronic Acid (HA), also known as hyaluronan or hyaluronate, is a carbohydrate, occurring naturally throughout the human body. Because HA is one of the most hydrophilic (water-loving) molecules in nature with numerous benefits for the human body it can be described as "nature's moisturizer". Although Hyaluronic Acid can be found naturally in almost every cell in the body, it's found in the greatest concentrations in the skin tissue. Young skin is smooth and elastic and contains large amounts of HA that helps keep the skin stay young and healthy. Here is my review. The Episilk Facial Scrub uses Exfo-Amber, a fossilized plant resin to gently exfolitate your face while the hyaluronic acid and other all-natural ingredients moisturize and soothe your skin. It's gentle enough for daily use and great for sensitive skin. It contains no harmful parabens and is spa tested and fragrance free. Infused with premium, high molecular weight hyaluronic acid and is made with a high quality formula that lightly exfoliates and moisturizes; leaving skin soft and improving skin appearance. I really liked this facial scrub. Unlike other scrubs that can leave skin left feeling dry and itchy, it was very moisturizing and gentle. I really noticed an improvement in my skin after just one use. I didn't have any redness bad reactions and loved the way my skin felt. The retail price is just $19.95 and I highly recommend you try it! 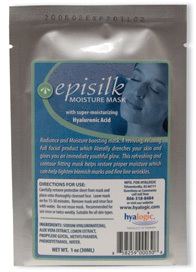 The HA Moisture Mask is a radiance and moisture boosting mask. It's a reviving, relaxing full facial product which literally drenches your skin and gives you an immediate youthful glow. This refreshing and contour fitting mask helps restore proper moisture which can help lighten blemish marks and fine line wrinkles. I was so impressed with this moisture mask! It felt like a drink of water for my skin! After just one use, it literally took years off my skin and even faded old scars and plumped fine lines. My skin never felt so good. This should definitely be a must have in your skincare routine. It retails for just $9.95, which is a steal for the results you get after just one use. Please visit http://www.hyalogic.com/ to learn more.